The Japanese consumer electronics giant, Panasonic has recently announced its new 3CCD Full HD camcorder which named as HDC-SD5, the small and stylish camcorder that use the AVCHD format to capture full HD video (1920 x 1080 pixels resolution) at the rate of 30 frames per second. The company also has included Panasonic’s original 3CCD camera system and advanced O.I.S. (Optical Image Stabilizer) in this camcorder, which aimed to provide clear, beautiful, blur-free images with vibrant colour. In addition, the AVCHD camcorder also features a new USB Host function that improves data storage and playback ease. 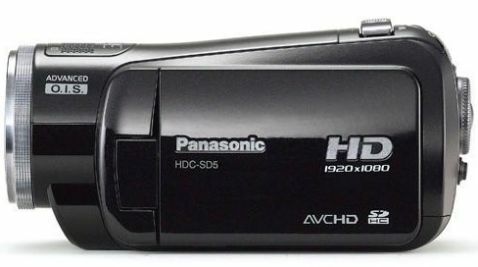 With an 8GB SDHC memory card, this full HD camcorder can store as much as 3 hours of HD video and allow fast transfer from the memory card to your notebooks/computers. The Panasonic HDC-SD5 that measures 2.6 x 2.6 x 5.3-inch and weighs 0.75lb will be available in coming September for about $1000.